This is the third in a series of articles discussing corneal opacifications. There are several etiologies of corneal opacifications that do not stain with fluorescein. These include corneal pigmentation, fibrosis, calcium or lipid deposition, cellular infiltration, the presence of a foreign body, sequestrum, and/or edema. This article will concentrate on corneal opacifications arising from pigmentation. 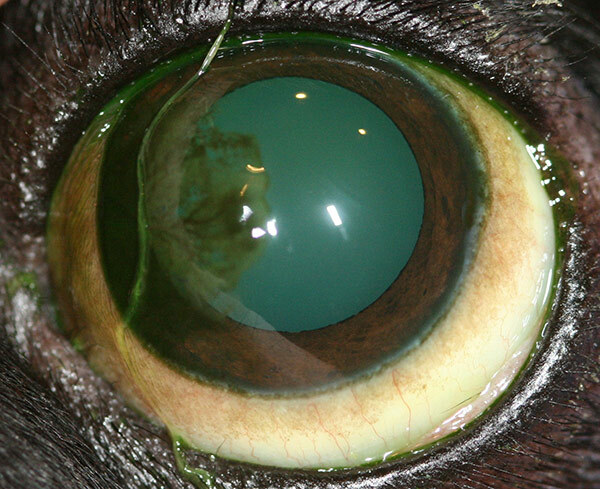 In the canine, corneal pigmentation may arise in the corneal epithelium, the corneal stroma, the corneal endothelium, or may extend from an iris prolapse following corneal rupture. A corneal epithelial pigmentation is due to the presence of intraepithelial melanocytes, or melanin granules within epithelial cells, and is termed a pigmentary keratitis. Corneal stromal pigmentations are secondary to the formation of corneal sequestra, incursions of a limbal melanoma, or the invasion of a pigmented fungus. Corneal endothelial pigmentations may be secondary to an iris melanoma’s compression of the corneal endothelia, anterior adhesions of the iris to the cornea (associated with pigmented keratic precipitates), or migration of pigmented cells from the drainage angle to the endothelia. A pigmented corneal foreign body (plant material) can also present in any, or all, of the corneal layers. This article will focus on corneal epithelial pigmentation (melanosis). Corneal epithelia do not normally contain melanin. However, the eyes of many animals, and some humans, may possess a pigmented ring surrounding the corneal limbus. In many species (including the dog), this limbal pigmentation is derived primarily from conjunctival melanocytes and melanin granules within conjunctival epithelia. Stem cells for non-pigmented corneal epithelia are found within the corneal scleral limbus rostral to these pigmented rings. These stem cells normally replace corneal epithelia and act as a barrier to the migration of the pigmented conjunctiva. An extensive or incessant corneal injury will deplete corneal epithelial stem cells. Pigmented conjunctiva will then migrate to fill the corneal defect. Studies utilizing guinea pigs have also shown that corneal epithelial pigmentation is preceded, and accompanied by, corneal vascularization. Corneal vascularization is secondary to corneal inflammation and/or hypoxia. Chronic corneal diseases associated with inflammation or hypoxia can deplete corneal stem cells resulting in corneal melanosis. Diseases associated with chronic corneal inflammation include superficial keratitis, non-healing ulcerations, infected corneal ulcerations, partial or complete facial nerve paralysis, trichiasis, distichiasis, entropion, and upper eyelid deformities. Diseases associated with corneal hypoxia, as well as inflammation, include keratitis conjunctivitis sicca, tear film abnormalities, and partial or complete facial nerve paralysis. Once corneal epithelial stem cells are depleted, the prognosis for the regression of corneal melanonis is poor. Pigmented corneal epithelia can be removed via keratectomy, but the cornea will continue to be repopulated by pigmented conjunctiva. A more effective strategy is to eliminate the underlying inflammation, tear film disorder, or physical defect that causes chronic ocular trauma. Autologous and allologous corneal stem cells transplantations have been successful in humans, but these procedures have yet to be attempted by veterinarians on companion animals. Following corneal epithelial stem cell depletion, some limbal stem cells will remain. These cells have been shown to partially depigment the corneas of rabbits following amnionic membrane transplantion. The amnion may release growth factors that reactivate residual limbal stem cells within the corneal epithelia. Unfortunately, subsequent corneal trauma, inflammation, and/or hypoxia will continue to deplete corneal stem cells, negating the efficacy of these procedures. If you have further questions concerning the differential diagnoses of corneal pigmentation, please feel free to consult with a veterinary ophthalmologist. Figure 1: Corneal Opacification – Corneal Pigmentation.